Two Lego minifigures who don't let their size stop them exploring the world recently spent time in Brisbane and this is where they ventured while sightseeing in our city. The two tiny figures visited the City Botanic Gardens, went for a walk over the Goodwill Bridge, visited the fabulous artwork at GOMA and climbed the Story Bridge. Enjoying the white Lego at GOMA. The brains behind sharing the minifigures adventures are Christel and Chantal. They are a couple on Instagram and have been together in real life since 2009. Born in the Netherlands but they now call Australia home, the girls love to travel and share their travel experiences with anyone who is interested. 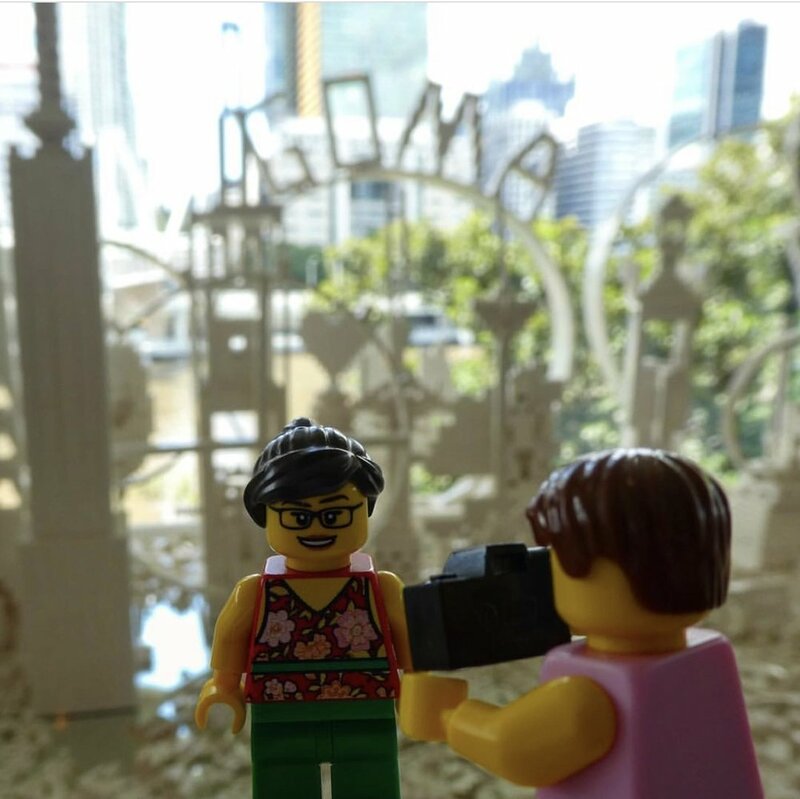 While Christel and Chantal don't particularly like photos of themselves they use the Lego minifigures to portray themselves enjoying and experiencing their destinations. The ladies behind the Lego minifigures Christel and Chantel. Their upcoming adventures include the Netherlands, Ghent in Belgium, Cancun in Mexico, Cuba, South America and the girls are currently planning a road trip to Uluru hopefully in a VW Kombi. If you have an Australian destination suggestion for Christel and Chantel they would love to hear from you and you can contact them here. We have seen many beautiful places all over the world and we hope many more will follow, but somehow Australia has this special place in our heart. Here we fell in love and here we started our life together, so we are always keen to see more and experience more of this beautiful country such as on our recent trip over the Easter long weekend to Brisbane. Follow the adventures of the Lego minifigures on their Instagram account @legominifigurestravel here.